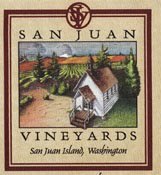 San Juan Vineyards first vintage was in 2000 with thirty-five cases of Madeleine Angevine from their estate vineyard. This wine, along with the Siegerrebe, which is also from estate fruit, are the signature wines for the winery. They account for thirty percent of San Juan Vineyards’ overall production. 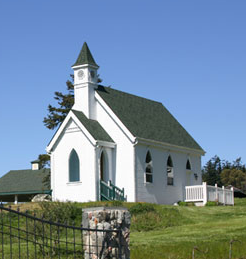 Due to the coastal location of the seven-acre estate vineyard, Madeleine Angevine, Siegerrebe, and Pinot Noir are the only grapes grown there. For the rest of its wines, the winery sources fruit from vineyards in eastern Washington, including Destiny Ridge, Alder Ridge, Kestrel, Red Willow, and Coyote Canyon. San Juan Vineyards produces 4,000 cases annually. Rating: + (Good) Shows just a tinge of color. An enjoyable, aromatic wine with a complex, evolving nose with floral notes, Asian pear, mandarin oranges, spice, and mineral. Tart and austere on a palate that shows an abundance of citrus flavors but little fruit otherwise. 100% Madeline Angevine. San Juan Vineyards. Fermented in stainless steel. 11.2% alcohol. 0.05% Residual Sugar. 11.2% alcohol. 583 cases produced. Recommended. Rating: + (Good) Just a tinge of color. A pretty nose with sugared pink grapefruit, apricot, and mineral notes. Tingles the tongue with acidity on a very dry wine with crisp fruit flavors. Finish rolls and evolves. 100% Riesling. Smasne Brothers Vineyard. Fermented in stainless. 13.4% alcohol. 0.6% Residual Sugar. 233 cases produced. Rating: + (Good) Nose shows classic varietal aromas of cherry, herbal notes, and bell pepper. An even palate with an abundance of fruit. 100% Cabernet Sauvignon. Kestrel View Estates (Yakima Valley). Aged 20 months in French and Hungarian oak. 14.3% alcohol. 324 cases produced. Rating: . (Decent) Oak aromas are at the fore on the nose with dill, caramel, and spice accompanied by cherry, herbal notes, and a touch of licorice. A rich, thick wine on the taste with a lot of good things going on but the oak is a bit obtrusive. 100% Merlot. Kestrel View Estate Vineyard (Yakima Valley). Aged 20 months in French, American, and Hungarian oak. 14.3% alcohol. 351 cases produced. Rating: . (Decent) Light straw colored. Nose is marked by spice, butter, hay, and abundant oak aromas. Tart and acidic on the palate while retaining a rounded mouthfeel. A pleasant wine overall but the oak seems a bit too up front.100% Chardonnay. Kestrel Vineyard (Yakima Valley). Aged 9 months in French and American oak. 14.3% alcohol. 550 cases produced.